Chai Feldblum, who is a lesbian and whose father was an Orthodox Jewish rabbi, is one of the EEOC’s five commissioners, nominated in 2010 by Barack Obama. Her term is up and Donald Trump nominated her for another term. Usually Senate confirmation for EEOC commissioners is a formality, but Lee is holding up Feldblum’s appointment because he claims that she wants to “use the might of government to stamp out traditional marriage supporters” and that she opposes marriage herself. If she and two other nominees aren’t confirmed by the time their appointments run out on December 31, the EEOC will have three open seats and will not be quorate, so the commission will not be able to make decisions. The EEOC focuses on workplace discrimination, and lack of quorum would mean that they could not decide on discrimination and sexual harassment claims brought to them. Usually the Senate confirms with commissioners without controversy since they get confirmed together. Feldblum nomination is happening along with two other, Republican nominees. In a statement this past February, Lee said that Feldblum has “radical views on marriage“… because she signed a document in 2006 calling for the government to protect non-marital relationships like caregivers, domestic partners, and close friends and siblings who live together. “Don’t think for a second that you, your family, and your neighbors will be left alone if Feldblum gets her way,” Lee wrote in the statement, saying that Feldblum will side with LGBTQ people even if someone who discriminates claims that they were motivated by their religion. Feldblum’s actual views on religious exemptions are not that extreme, though. She said in a statement in August that she believes the law is really about balancing the burden put on religious people and the government’s interest in stopping discrimination. “If one believes there is only a ‘win-lose’ battle, then everyone must be painted as a radical advocate of one side or another. But that is not a constructive way forward,” she wrote in a statement. She wrote that “the government should respect a statement by a religious person that complying with a non-discrimination law or some other law will place a burden on that person’s religious beliefs,” and should provide an accommodation if the purpose of the law can still be achieved. LGBTQ advocates are calling on Senate Majority Leader Mitch McConnell to hold a vote even though Lee has a hold on Feldblum’s nomination because Democrats believe that there are enough votes to confirm all three nominees. 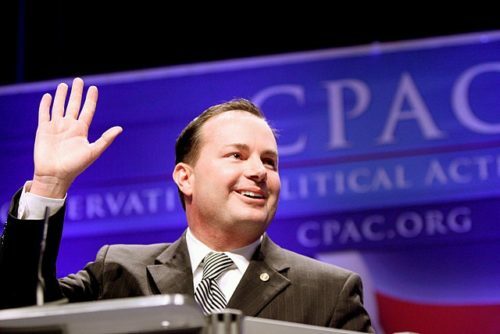 “Senator Mike Lee’s opposition to Commissioner Feldblum is not based on merit, but rather an opposition based who she is and how she doesn’t align with the Senator’s anti-LGBTQ beliefs,” said GLAAD President Sarah Kate Ellis.